In less than two decades, U.S. Navy Captain James Lovell (ret) participated in four groundbreaking space flights. In 1968, Lovell was assigned to be the Command Module Pilot of Apollo 8 - man's maiden voyage to the Moon. It was during this flight that Lovell and his fellow crewmen became the first humans to leave the Earth's gravitational influence, and to see the far side of the Moon. Jeff Bezos is the founder of aerospace company Blue Origin, which is working to lower the cost and increase the safety of spaceflight so that humans can better continue exploring the solar system. In 2014, Bezos and his team received The Explorers Club Citation of Merit for recovering the F-1 engines of the Saturn V rocket that sent Apollo 11 astronauts to the moon. The Citation of Merit - Edith A. Widder, Ph.D.
Dr. Edith Widder's distinguished career as a deep sea explorer includes the study of how the ocean's inhabitants use bioluminescence to help them survive in the ocean's darkest depths. 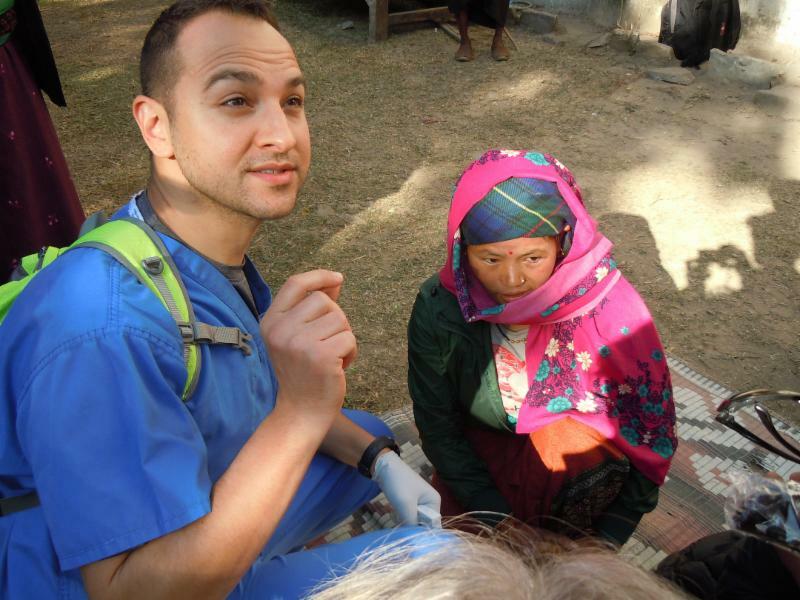 David Dolan has committed his life to combine his passion for exploration with international humanitarian service. He established health clinics, orphanages, water wells, and housing projects on four continents and climbed Mt. Kilimanjaro and Mt. Kenya to raise funds to fight poverty. Dr. Gino Caspari is a Swiss archaeologist and explorer. The Fulbright alumnus and Columbia University graduate focuses on the discovery and analysis of ancient landscapes, graves, and ruins. Trevor Wallace is an expedition filmmaker focusing on the wild, remote corners of the world and stories of the human spirit. Trevor has conducted three investigative and field research expeditions with Dr. Caspari, capturing their search for Scythian tombs in the feature documentary Frozen Corpses Golden Treasures. To mark Antarctica Day (Dec. 1), the International Association of Antarctica Tour Operators (IAATO) launched a free iOS and Android app for staff guiding visitors in Antarctica that makes it quick and easy for users on-the-go in the field to access essential information, without the need for a phone signal. 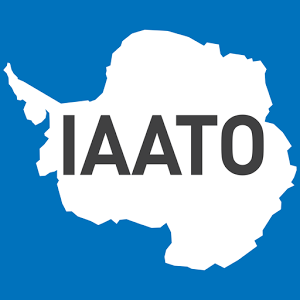 IAATO, a member organization formed in 1991 to advocate and promote the practice of safe and environmentally responsible private-sector travel to the Antarctic, developed the new Polar Guide: Antarctica app to include existing operational procedures and guidelines for wildlife watching, visiting specific sites, being a responsible Antarctic visitor, preventing the introduction of alien species and more. The app is also intended to be a useful resource for anyone visiting or keen to learn more about Antarctica, the Antarctic Treaty and the work being done to preserve the continent's extraordinary landscape and wildlife. It's available free from the iTunes store and play.google.com. 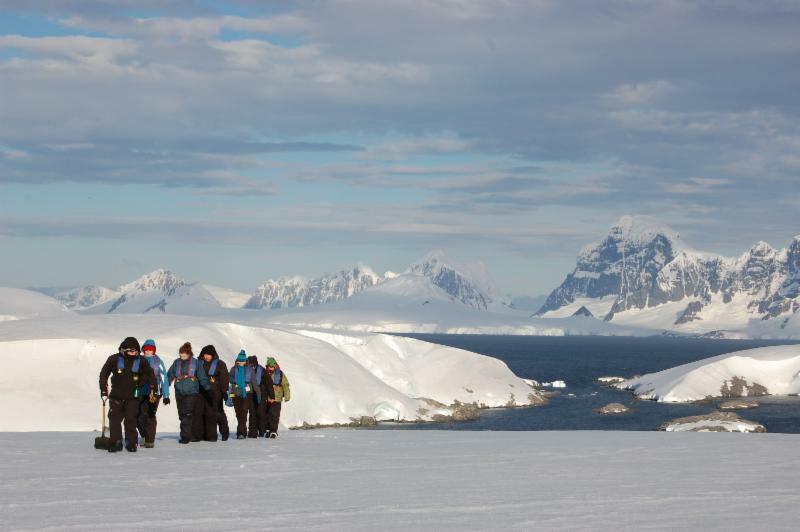 In 2016-17, the total number of visitors traveling to Antarctica with IAATO members was 44,367, an increase of 15% compared to the previous season. Overall, levels of visitation, particularly in the cruise sector of the industry, has been increasing steadily since 2011-2012. IAATO's estimate for next season, 2017-2018, shows continued growth in line with global trends with 46,385 visitors expected, an increase of 5% that would see visitation reaching the peak of 46,265 reported by IAATO in 2007-08. "Our mission was accomplished. But at the same time we had accomplished something infinitely greater. How wonderful life would now become! What an inconceivable experience it is to attain one's ideal and, at the very same moment, to fulfill oneself. I was stirred to the depths of my being. Never had I felt happiness like this - so intense and yet so pure. That brown rock, the highest of them all, that ridge of ice - were these the goals of a lifetime? Or were they, rather, the limits of man's pride?" - Maurice Herzog (1919-2012) upon reaching the top of Annapurna in 1950. At 8091 m (26,545 ft.) is was the highest peak yet summitted at the time. Source: Annapurna, Heroic Conquest of the Highest Mountain Ever Climbed by Man by Maurice Herzog (E. P. Dutton & Co. Inc., 1952). 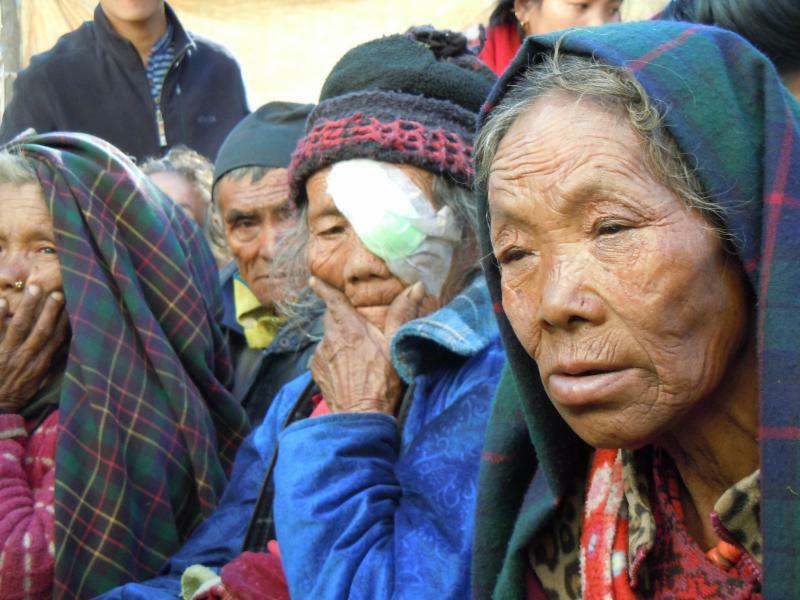 A team of leading ophthalmologists traveled to a remote region of Nepal to tend to the eye care needs of over 800 remote villagers in the Upper Gorkha region, near the epicenter of the massive earthquakes and aftershocks in 2015. The expedition was focused in the roadless region of the approach trek to Mt. Manaslu. The team, which traveled by 4WD for eight hours, then trekked for eight hours on foot, accompanied by a mule caravan. Advanced Eye Medical Group, Mission Viejo, Calif.
procedures in medicine since patients are "cured" overnight, often with full restoration of their eyesight. The following are excerpts of trip reports which were written on an iPhone then held four days until the team could access internet service. Read the complete trip reports at www.dooleyintermed.org. Kathmandu at Last. The Dooley Intermed-Operation Restore Vision Team Arrives. What do you do for 12 hours in the air? Frankly, whatever you can to pass the time: watch two movies, finish Annapurna by Maurice Herzog, eat three meals, read the airline in-flight magazine, clean out your wallet, make space by deleting iPhone photos, sleep in an upright position (good luck with that), play iPhone blackjack, and rip articles out of magazines to read again maybe never. Kathmandu is the loud, raucous, polluted capital of Nepal. A city of 1.2 million that assails every sense from the moment you arrive at Tribhuvan International Airport. We pass hundreds of tiny store fronts, mopeds seemingly coming at us from all directions, dogs everywhere in the streets and pedestrians wearing dark clothes on dark, poorly-lit washboard streets. Imagine you live in a remote Nepali village one day's trek from the nearest road. Now imagine a group of strangers arrive with sharp instruments and want to operate on your eyes. It requires an abundance of faith. We pay to pose with a sadhu, a colorfully decorated Hindu holy person said to renounce all worldly possessions. However, our guide tells us this particular fellow's insistence on being paid for photos makes his piety somewhat suspect. 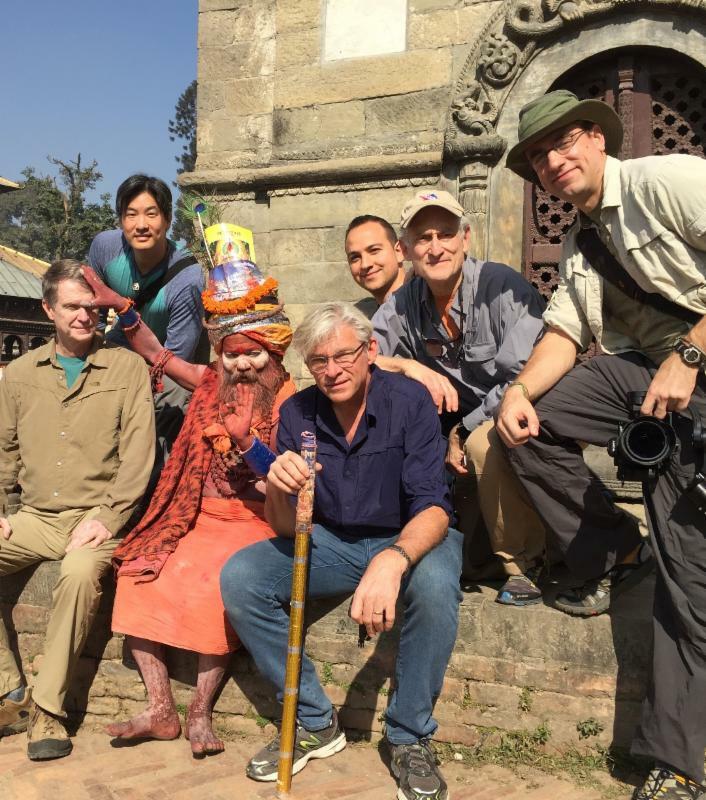 The expedition team visits Pashupatinah Temple (the author is second from right). We suspect the sadhu is a fake fakir. But it makes a great photo for the folks back home. 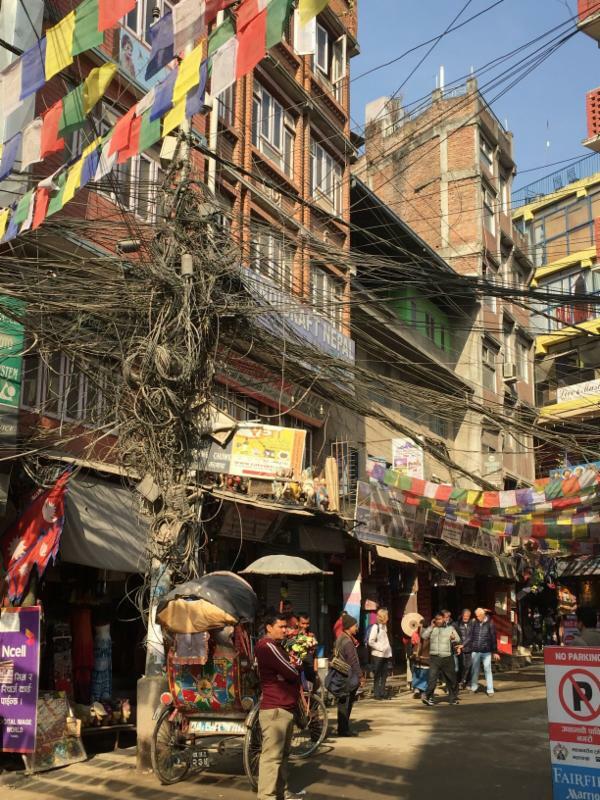 Rubber spaghetti on every pole in the Thamel commercial neighborhood of Kathmandu. Tomorrow we travel by 4WD eight hours into the hills, then trek from there on foot for 10 hours with mules. It's in these remote areas at the end of the road - and beyond - that Dooley Intermed does its best work. Bone-jarring. There I've said it. How else to describe an 8-hour 4WD kidney-rattling drive from Kat to Soti Khola about 80 miles away. Dust kicked up by the bus ahead inhibits our vision. Leaves are coated a mocha brown. The roads are more like trails. You can't read, you can't sleep. As you're Maytagged on washboard roads, you hold on and try to absorb the shocks as if riding a bucking bronco. Sunday morning the plan blessedly allows us to leave the claustrophobic 4WD's behind and trek on foot two hours and 1,000 feet higher to Lapu Besi, our stop for the night. The porters and cooks follow behind, aided by pack mules to carry our personal and medical gear. I marvel at the speed of one porter who passes me at a good clip. I'm kitted out in Sherpa fleece, LEKI collapsible poles and Hi-Tec boots with Michelin soles that mimic car tires. Yet I'm smoked by an elderly gentleman loaded down with a camera case and medical equipment while wearing open-toed rubber sandals, both of his heels listing to either side. These are strong, resilient people for sure. Gingerly crossing a tremendous landslide caused by the earthquake, we arrive at Machhakola to applause from a crowd of 100 Nepalis eagerly awaiting our arrival. Marigold garlands are ceremoniously placed over our heads. 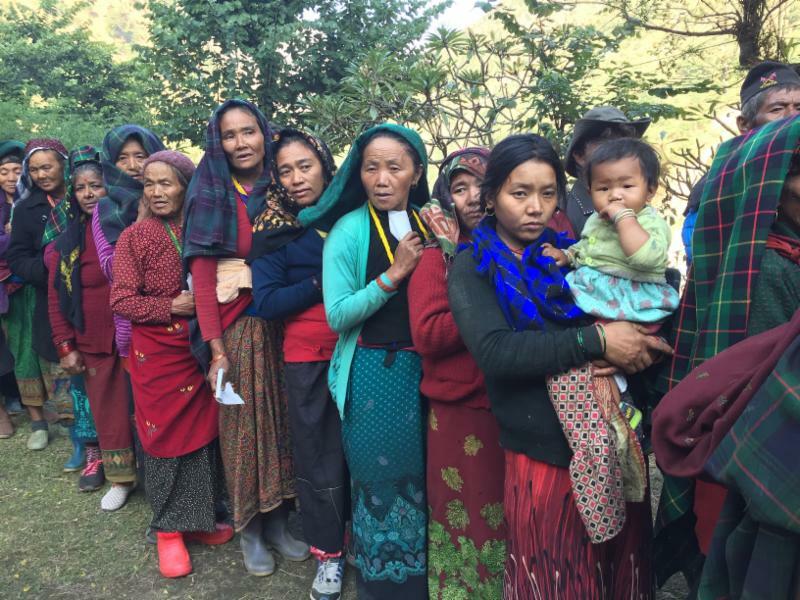 Patients await eye exams in Machhakola. Dozens of Nepalis crowd our makeshift examination room. We hit the ground running. These people have so little, their lives made harder still by the spring 2015 earthquake whose epicenter occurred here, directly below the hillside village of Machhakola. A single water tap in the central square provides water for drinking, washing, cooking. Those of us with delicate western stomachs give it a wide berth as we frequently apply Purell sanitizer to our hands. Omar Ozgur, MD, Oculoplastic Surgeon at Advanced Eye Medical Group, Mission Viejo, Calif. Into all of this arrives the Dooley Intermed-Operation Restore Vision team. In short order, our ophthalmologists find patients with facial skin cancer, blocked tear ducts, droopy lids, chronic eye infections, and over 76 operations are scheduled, mostly mature cataracts rendering the patients blind. So far its been a grueling, but intensively satisfying trip. This morning was the reveal for 42 surgery patients; bandages were removed, doctors performed a final check, and sunglasses were distributed. Chinja Ghale, 65, is a proud Nepali who became blind three years ago. For five hours yesterday, her son-in-law guided her along precipitous trails to the Dooley Intermed - Operation Restore Vision eye camp here in Machhakola. Cataracts in both eyes turned her world into darkness. She walks barefoot to better feel the ground. Cataracts removed, Chinja (far right) can now see again for the first time in three years. Yesterday, the mature cataracts were removed from both eyes, replaced by intraocular lenses. As expedition leader Scott Hamilton, a certified ophthalmic technician, removed both bandages from her eyes, a smile came over her deeply lined face. Through a translator, she tells videographer Daniel Byers she is looking forward to returning to the fields. Her son-in-law, for his part, no longer has to serve as caretaker. Ophthalmologist Chris Teng was astounded. "I started residency in 2005 and this is the first time I've seen someone with bilateral (both eyes) mature cataracts make such a complete recovery. In the States you typically don't see cataracts this advanced. Friday is our planned extraction by helicopter. The sooner our doctors return to their U.S. practices, the better. In May 2016, four Bengali mountaineers attempted to achieve a lifelong dream: summiting Mount Everest. After an egregiously late start to their summit attempt, they were abandoned by their guides and left to die on the mountain. Only one survived. The late Goutam Ghosh turned the camera on himself. In an interactive article with harrowing video footage, John Branch of the New York Times, reports on the ill-fated expedition and how a team of sherpas recovered the frozen bodies of Goutam Ghosh and Paresh Nath from 27,000 feet above sea level. Nepal officials have proposed banning from Everest climbers with complete blindness and double amputation, as well as those proven medically unfit for climbing, according to The Himalayan Times (Dec. 6). The government move comes at a time when Hari Budha Magar, a former British Gurkha who lost both his legs in wars, announced he would climb the world's highest peak next spring. Magar had already climbed Mera peak as part of his training for Mt. Everest, according to US-based Myrmidon Expeditions, which was planning an expedition for Magar along with Himalayan Ski Trek in Kathmandu. Noted climbing blogger Alan Arnette, based in Fort Collins, Colo., writes, "... banning everyone with a disability to stop one person seems a bit of overkill. "So what constituents a disability or who is 'proven medically unfit for climbing?' If this is about protecting people from their own ambitions, then over half of the annual climbers should be banned each year as they lack the experience to safely climb Everest. "And where does this stop - people with asthma, diabetes, hemophiliacs or cancer? 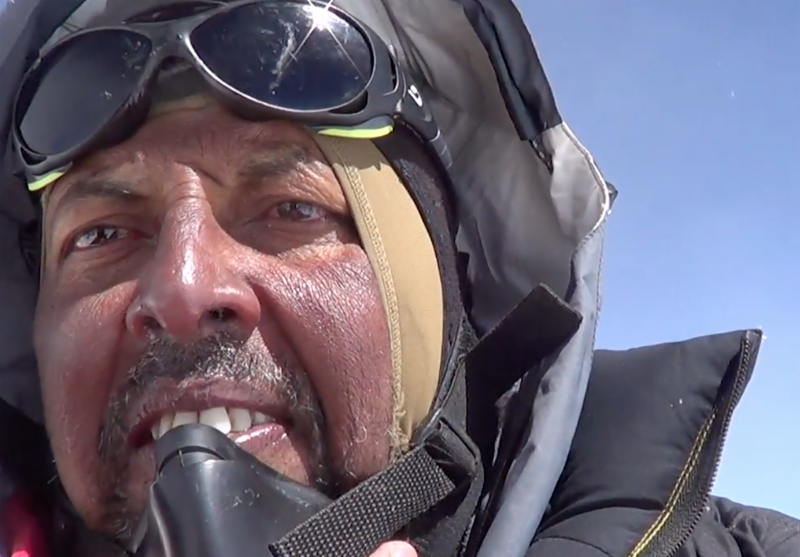 All of these have recently successfully summited Everest with no problems," Arnette writes. Are you an explorer or adventurer with an interesting story to tell? There are two services that offer to connect you with radio interviews and podcasts. If you have an inspirational story to tell or are promoting a book, here are two services that can connect you with radio and podcast hosts. Good luck. If you land that big interview, send us a link to share. The American Alpine Club announced a new series of snowboard-specific mountain exploration grants in partnership with Jones Snowboards. The new grants are aimed at supporting amateur backcountry snowboarders and their dreams of mountain adventure and winter exploration. Both grants will provide $1,500 in financial support to assist with expedition travel and logistics and provide a new Jones splitboard, skins and backpack. The Jones "Live Like Liz" Award honors aspiring snowboard mountain guide Liz Daley who was killed in an avalanche accident in 2014. The award seeks to support female snowboarders who exhibit a similar passion for wilderness exploration as Liz. Applicants for the newly established grants must be American Alpine Club members and grant proposals will be considered based on objective remoteness, exploratory nature, carbon footprint, creativity and overall significance. Objectives may be a single line/peak or a tour/traverse of a wider region. Project locations must be in North America and be completed in 2018. Applications for both grants are being accepted between December 12, 2017 and January 30th, 2018. Award winners will be announced in February 2018. 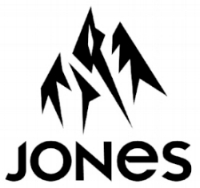 Jones Snowboards company founder Jeremy Jones and Jones brand managers will review all applications and select the recipients. A long time reader suggests we make clear that Vanessa O'Brien's first summit of K2 by both an American and British woman (she holds dual citizenship) should be clarified as the first such successful summit (see EN, December 2017). In 1986, Briton Julie Tullis summited K2; Briton Alison Hargreaves summited in 1995. Neither climber survived the descent. On Aug. 4, 1986, Tullis reached the summit via the Abruzzi Ridge shortly after Alan Rouse, these two becoming the first and second British climbers to do so (and Tullis only the third woman ever). Sadly, both would die shortly thereafter, succumbing to altitude while trapped in a prolonged storm on the Shoulder. At the time of Hargreaves' death, a Pakistani army officer disclosed that he had begged her not to make her assault on the mountain, warning that because of the weather conditions, to do so would be "suicide." Hargreaves was missing her husband and children greatly, and had appeared to relent, Captain Fawad Khan said, but then her passion "gripped her again" and she set out on her last climb. "I haven't the faintest idea. The only convincing evidence, really, would be if Mallory's camera were found with shots that indicated he had been to the summit. (It hasn't been.) There is, of course, the other very important factor, and all the mountaineering world knows this: It's one thing to get to the top of a mountain, but it's not really a complete job until you get safely to the bottom." 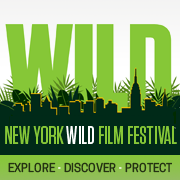 The New York WILD Film Festival is the first annual documentary film festival in New York to showcase a spectrum of topics, from exploration and adventure to wildlife, conservation and the environment, bringing all things wild to one of the most urban cities in the world, Feb. 22-25, 2018. Chris Kostman, race director at Badwater, and chief adventure office at AdventureCorps says of the festival,"The films are riveting, compelling, and inspiring, and sometimes depressing - but in a way which inspires action. There is always a great selection of filmmakers and other speakers there, plus the audience is packed with exceptional, learned, engaged conservationists, explorers, scientists, media, film lovers, and filmmakers from around the globe." 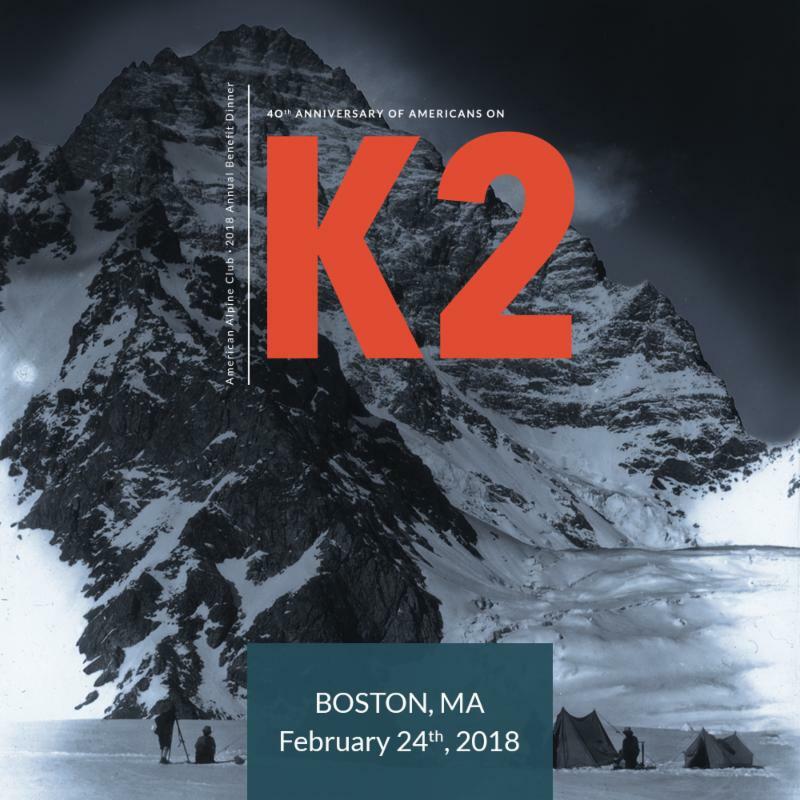 The AAC will celebrate the 1978 American K2 Expedition at its annual dinner in Boston, Feb. 23-24, 2018. Jim Whittaker led the 1978 expedition that put the first Americans -Jim Wickwire, Louis Reichardt, Rick Ridgeway, and John Roskelley - on the summit. The 2018 Annual Benefit Dinner features a keynote from Gerlinde Kaltenbrunner, the first woman to climb all 14 8000 m peaks - including K2 - without supplemental oxygen or high altitude porters. 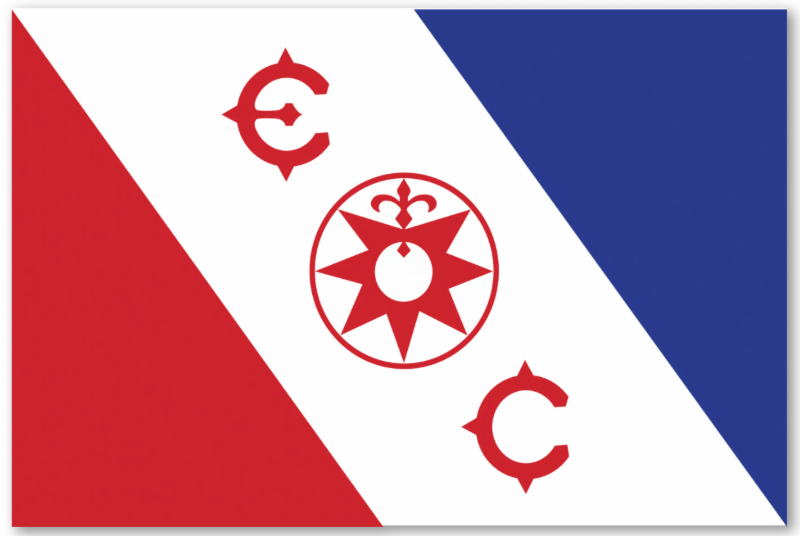 Hundreds of explorers and adventurers raise money each month to travel on world class expeditions to Mt. Everest, Nepal, Antarctica and elsewhere. 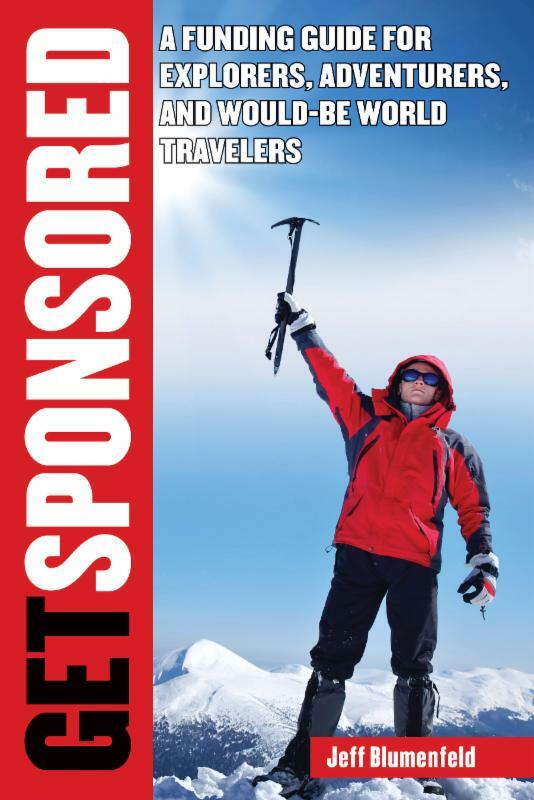 Now the techniques they use to pay for their journeys are available to anyone who has a dream adventure project in mind, according to the book from Skyhorse Publishing called: Get Sponsored: A Funding Guide for Explorers, Adventurers and Would Be World Travelers.